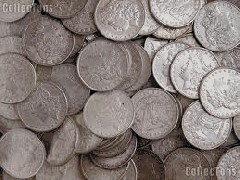 Silver Dollars All Over Texas! Since 1993, Compass has held Steeling the Mind Bible Conferences that defend the accuracy of the Bible. By providing this Biblical armor, it is our hope a Believer can better “make a defense” of what and why we believe (1Pet 3:15). And as the world turns slowly toward God’s predetermined conclusion, we expect to have more and more opportunities to be used by God in the lives of friends, family and loved ones. Nothing like being armed for action! With that in mind, see if you can get your arms around these facts: There are over 300 prophecies in the Bible of Jesus’ first coming, all having come true. What would be the odds of just eight of these prophecies coming true? Suppose we filled the entire State of Texas with 100 trillion silver dollars. That would make the entire state about two feet deep in coins. Then we mark only one coin. Next we stir-up the state full of coins so they are thoroughly mixed and random. The marked coin could be anywhere in the state in the two foot deep coins. Finally we blindfold a man and let him travel the entire state to choose one random coin. What would be the odds of him finding the marked coin in one try? He would have the same chance the prophets had for those eight prophecies being fulfilled. Which is virtually no chance. But that was only eight of the over 300 prophecies! Figuring the odds of fulfilling all 300 Bible prophecies is ridiculously astronomical. Simply incalculable– except that the real author of these prophecies knew the future. The God Who created the universe out of nothing was in total control and knows the past, present AND future. Mike does a great job, in layman’s terms, showing the utter impossibility of evolution in light of mathematical probabilities. Great to watch and pass around! Order today! I am a Christian who very much enjoys scientific apologetics, and wanted to point out a math issue with the silver dollar Texas reference. The land surface area of Texas according to the Encyclopedia Brittanica is 268,597 square miles. The census.gov site gives the nearly-identical number 268,596 square miles (695,662 square kilometers). This is equivalent to a square of 518 miles per side or 834 kilometers per side. The dimensions of an American Silver Eagle coin are 40.6 millimeters diameter, 2.98 killimeters thick, and the Morgan silver dollar is 38.1 millimeters diameter, 2.4 millimeters thick according to Wikipedia. A kilometer = 1000 meters = 100,000 centimeters = 1,000,000 millimeters. 834 kilometers are 834,000,000 millimeters. or 20,541,872 x 20,541,872 (basically 20 million coins per row in 20 million rows) = 421,968,502,026,254 total coins, one layer thick. That’s almost 422 trillion coins for a layer that is one coin thick. But, to make a pile 2 feet thick (609.6 millimeters) requires 609.6 millimeters / 2.98 millimeters per coin = 204.5 coins in thickness. That means that for each coin in the bottom one-coin layer you must add 203.5 coins. This works out to 203.5 x 422 trillion, or 8.63 x 10 to the 16th power = 8,630,000,000,000,000 coins. That is 8.63 quadrillion coins. This means the odds would be one in 8.63 quadrillion for the person wandering a Texas-size state 2 feet-thick in Silver Eagle dollars. The numbers are somewhat higher for the smaller Morgan Silver dollar: 479,161,758,323,516 one layer x 254/2 feet = 1.21 x 10 17th power : odds of one in 1.21 quintillion. So Peter Stoner was basically correct in his Texas 2-feet-deep in silver coins analogy, assuming 1 x 10^17 odds. Your 100 trillion number is too small by a factor of 10,000. It is actually 1 million trillion (1 x 10^17).